Director's Dish: Goodbye Summer, Hello Walk! Wow! Wow! Wow, what a week! I am feeling deeply humbled, overwhelmed with gratitude, extraordinarily energized and empowered! Our 3 walks this weekend kicked off our fall Walk season with a true bang! Including front page coverage in the Parkersburg News & Sentinel! I attended the Eastern Panhandle Walk this weekend, and as always, was overwhelmed by their passion and energy. Even the usually composed W was brimming with excitement. Our volunteer Walk committees did an amazing job, and I can not wait until September 21 for Elkins and Huntingon Walks!! Haven't registered for Walk yet? You can register right NOW by visiting, alz.org/walk! Last week we hosted a round table with Congressman McKinley about Alzheimer's disease and caregiving. The Congressman was attentive, articulate and passionate, and so were our advocates in attendance. The round table was a true testament to the fact that Alzheimer's knows no bounds, even if you are a United States Congressman. Our round table discussion was also a testament to the true power of advocates. If you are not an advocate, join our advocacy force now! Advocacy is critical to the fight against Alzheimer's. Last week, when Congressman McKinley asked, what can we do to get a handle on this disease? We had passionate advocates in the room able to answer with a resounding message, adequately fund research! But that meeting was only made possible the the hundreds of advocacy actions completed prior by advocates in McKinley's distrcit. From taking action alerts on legislation, to phone calls, to meeting with staff in their D.C. and West Virginia offices. Want more information about becoming an advocate? Give us a call or send an email to wvinfo@alz.org. Turn Facebook purple! In honor of World Alzheimer's Month, change your profile picture to the ENDALZ logo. You can find the graphic by clicking here! Calling all volunteers! Have a few hours to help answer phones or want to serve as a Helpline volunteer? Or help us promote Walk by putting up posters and wickets around town? Good with computers and data entry? We need your help! Interested in volunteering, contact us at wvinfo@alz.org or call 800.272.3900! We are starting to plan our spring educational events. If you are interested in hosting a workshop or think we should bring Caregiver University to your community, let us know! Call or email at 800.272.3900 or wvinfo@alz.org. The Dancing Through Time planning committee will be meeting next week in Morgantown! Join this fun and fantastic group of volunteers to help plan this entertaining fundraising event!! No dance experience necessary! :) Call or email Christina Beck if you are interested! cbeck@alz.org or 304.599.1159! Walk pictures! Stay tuned to our Facebook page for pictures from Walk to End Alzheimer's! We want your pictures too! Upload your pictures to our Facebook page, or email them to wvinfo@alz.org! I am a summer girl! The sun, the water, the garden, I love it all. So, this time of year I get a little down thinking about the impending winter. This weekend we had one last ode to summer in celebration of W's Dad's birthday and Grandparents' Day. Eric's nieces have been watching Mickey Mouse have weenie roasts at their clubhouse, so W's mom organized our own weenie roast, just like Mickey & Minnie. 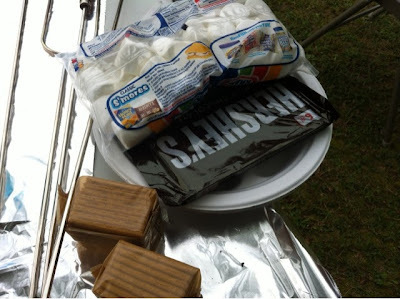 And, where there is a weenie roast, you HAVE to have S'mores! My personal favorite dessert of ALL time! 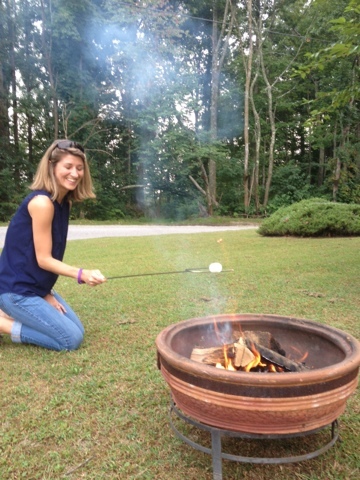 The best part, it is easy and fun to make, making s'mores truly a de-stressed dessert! You have to start out with a good camp fire! 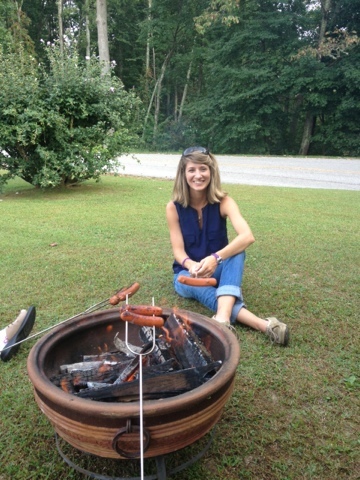 The weenie roasting part is optional, but since you have the fire going - might as well go all out, right? Organization is key to good s'more making, so make sure you prep your ingredients. 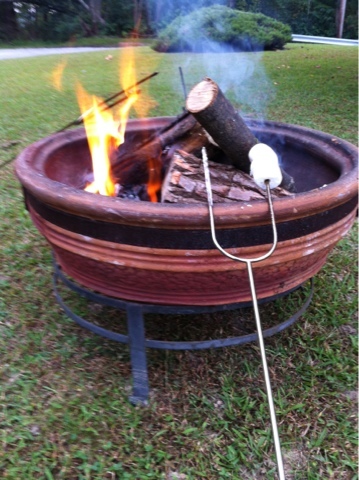 There is a science to the perfect marshmallow roast. You have to keep it near the heat to get the inside hot, as soon as you see it getting gooey on the inside, stick it in the fire to burn the outside. The next step requires quick reflexes. 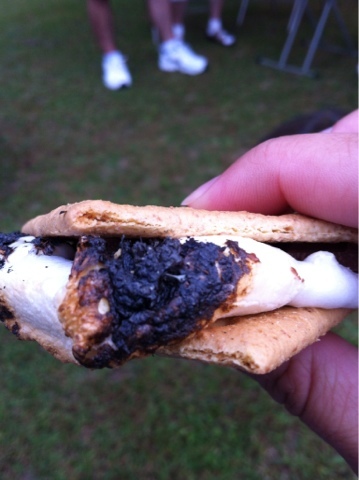 Using the edges of the gram cracker, scrape the marshmallow onto the gram cracker and quickly add the chocolate on top. 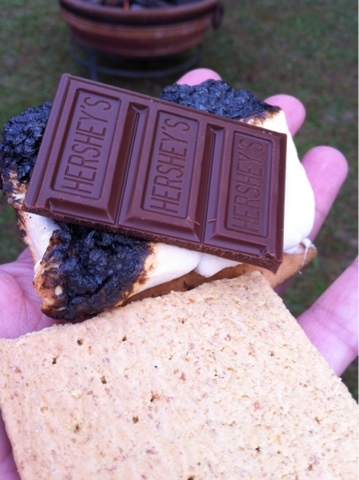 You want the heat from the marshmallow to melt the chocolate just enough. Now for the most important part. Dig in and enjoy the fire!